This is an idea for a filling, healthy breakfast. 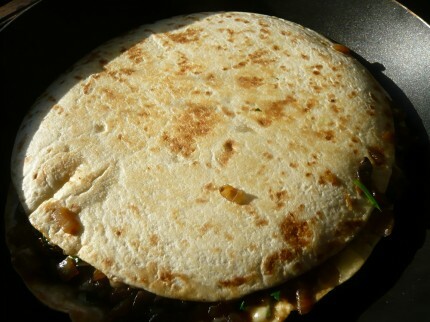 Melting cheese, caramelized onions, mushrooms, fresh parsley and a little garlic, gathered together between two crisp tortillas will make your morning awesome and will give you energy for a few good hours. 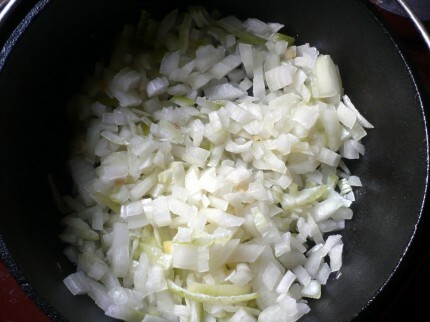 Take one onion, chop it and saute it with a bit of olive oil and salt. 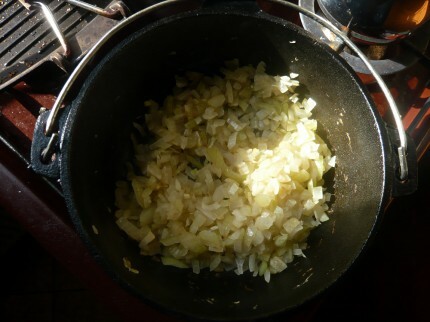 Saute the onions over medium-high heat for 3-4 minutes, until they start to caramelize. 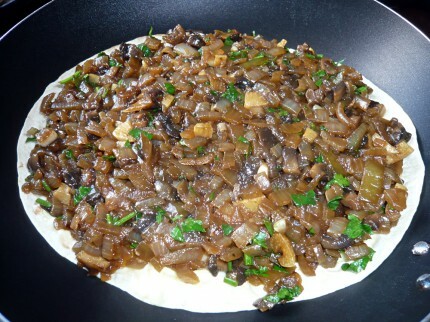 Get 5-6 white mushrooms, clean them, chop them, then add them into the pan and saute them together with the onions. Add a little bit of salt and ground black pepper. 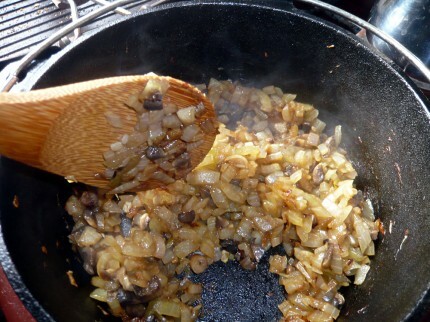 In about 15-20 minutes,mushrooms will be cooked, onions will be soft, so it’s time to add 3-4 garlic cloves, minced. Cook them for 1-2 minutes, then add about two tablespoons of beef broth to deglaze the pan. Keep on cooking until the broth evaporates. 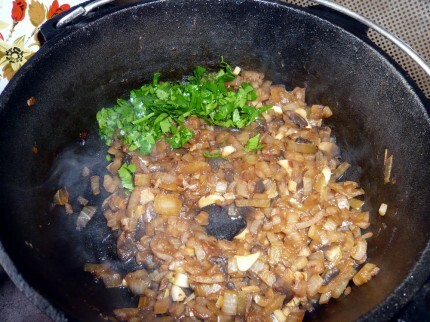 Remove from heat and add minced parsley (I added two tablespoons of fresh parsley). While the mushrooms are cooking, grate some cheese. You’ll need about 1 cup of grated cheese for one quesadilla. Heat a little bit of olive oil in a pan. Add one of the tortillas, rub it a little to coat it in oil and let it heat for 1 minute. Flip it on the other side and heat it for 1 minute. 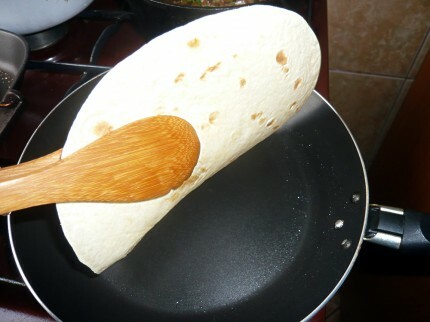 Set the first tortilla aside. Repeat the procedure with the second tortilla, then add half of the grated cheese on top of it. 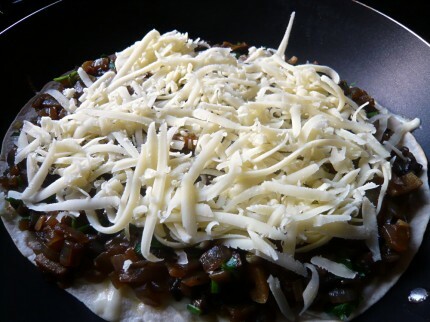 Add the onion-mushrooms mixture, spreading it evenly onto the surface. 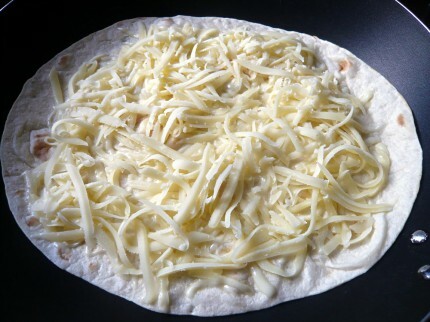 Spread the rest of the cheese on top, then cover with the other tortilla. 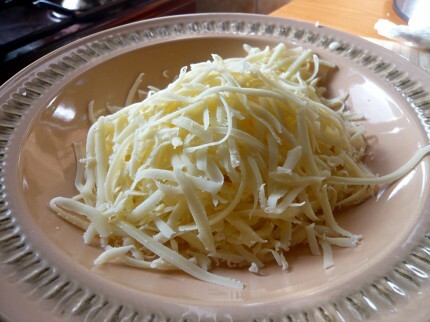 Cook it over low heat for about 2 minutes, then flip it and cook it for 2 more minutes or until the cheese melts. Take care when you flip it, because the filling will want to come out and spread all over your kitchen floor. 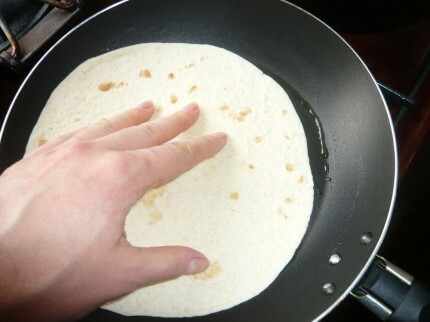 The easiest way to do it is to cover the pan with a plate, then with both hands, reverse the pan, so the quesadilla lands on the plate. Then let it slide from the plate into the pan. 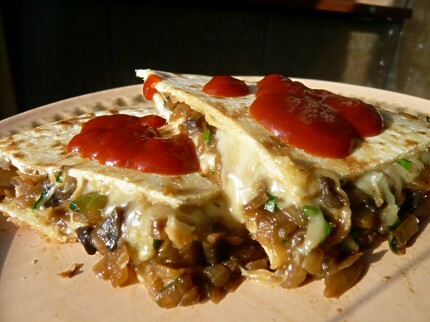 When ready, cut the quesadilla in quarters and serve it with salsa topping. 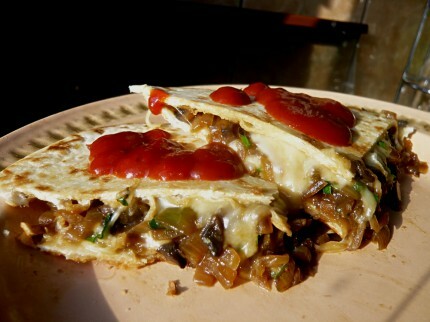 Quesadilla recipe with mushrooms and onions. Bon Appetit!